Bellator MMA is coming back to New Mexico for the third time this year. After successful shows in February and July, the promotion is scheduled to bring the New Mexico fight fans yet another stacked card full of action set to go down inside Rio Rancho’s Santa Ana Star Center. Arguably the story of the event early on is the participation of three fighters representing New Mexico on the undercard. It has become a normalcy now after three events for the Bellator MMA shows to host undercards full of the intriguing match-ups featuring local fighters and Bellator 105 will not be any different. The catch for this line up however is that the three marquee match-ups feature three bantamweights from three prominent New Mexico gyms. FIT NHB, Mean 1 MMA and Judgement MMA will all send their very finest 135-pound fighters to face some very stiff competition in the form of a wrestling champion, Bellator tournament finalist and a MMA veteran who has fought several UFC fighters. Frank Baca (16-3) will take on the very tough Luis Alberto “Betao” Nogueira (15-3), Steve Garcia (1-0) is set to match up with blue chip prospect Shawn Bunch (2-0) and Adrian Cruz (5-0) will square off with battle-tested Jesse Brock (15-7). Frank Baca will once again venture into the Bellator cage looking for a marquee victory. In the heart of downtown Albuquerque, Frank Baca will make the half hour trip from FIT NHB to the Santa Ana Star Center for his second go-round inside the Bellator MMA cage. In July, Baca was part of the Bantamweight tournament and would draw the very game Anthony Leone in the first round. Baca uncorked a brutal straight right that buckled Leone and would come very close to earning the referee stoppage after some ground and pound. Leone would survive the onslaught however and the fight would end up in the third and final round knotted up at one round a piece for each fighter. Leone would latch on a fight ending choke and Baca’s tournament hopes would end despite an impressive outing. Baca is one of the area’s most successful fighters regardless of weight class. He fought top ranked Mamoru Yamaguchi very early in his career and during his five-year career has only tasted defeat three times in nineteen outings. The Arlene and Tom Vaughn trained fighter has crisp boxing especially in close range and compliments that striking skillset with very technical wrestling and grappling abilities. His bout with Nogueira will be heavily interesting as the Brazilian has smothering grappling talent and powerful striking both on the feet and the ground. 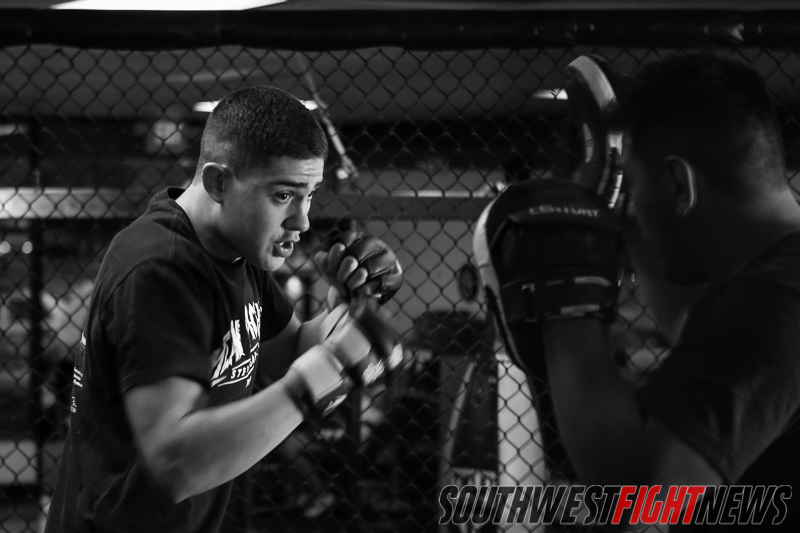 Mean 1 MMA’s Steve Garcia may be the most unknown of the trio and he may in fact be fighting the most notable opponent. 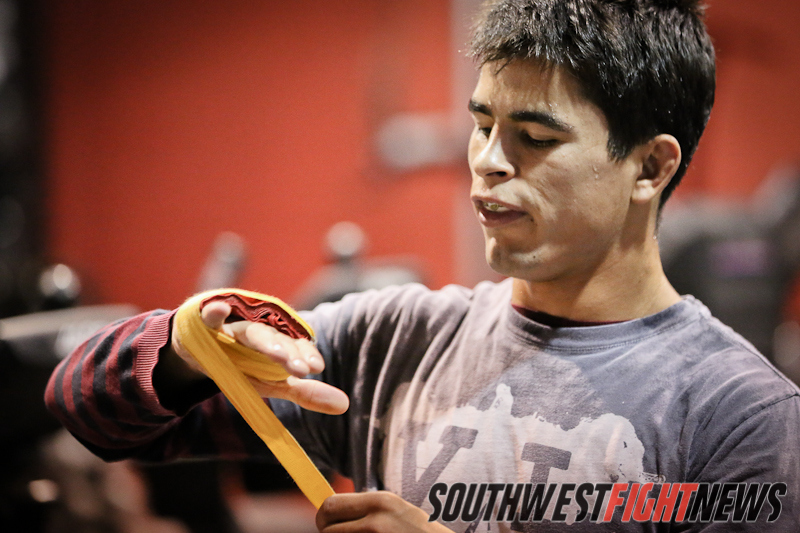 Garcia is the acclaimed bantamweight coming out of Rio Rancho trained by the gyms Head Coach Chris Luttrell. Garcia is a very tall 135-pound fighter and will contrast the short, compact frame of opponent Shawn Bunch. Fight fans should remember the US-National and Pan-American wrestling Champion Bunch from his thrilling three round battle with Lovato Total Fitness fighter Russell Wilson back at Bellator 97 in July. Garcia is undefeated in his amateur career and has had one professional fight since turning pro. That fight went down earlier this year at the inaugural Triple-A-MMA show where he defeated Alan Lerma by technical knockout early in the second round. The fight earned Garcia a shot at Bellator MMA in July but an injury would force him out and ironically this time around he’d still be matched with Bunch. Garcia is a very technical striker and uses his length to stifle an opponent offense. He will give Bunch a new look that his young career has yet to see as Garcia will tower over him in height and should enjoy a striking advantage. Making the shortest trip over to the venue will be Adrian Cruz, who will be the only fighter to fight on all three of Bellator MMA’s New Mexico shows. Cruz submitted Nick Gonzales in February with a slick submission and came back to TKO Felipe Chavez in July. Both of those opponents were local fighters, both of which at one time were training partners to Cruz. This time around at Bellator 105, “Killa” Cruz will face off with an opponent of superior experience which may in fact be the one weakness of the Rio Rancho fighter. The Scott and Robin Marlowe trained Cruz is well-rounded in all facets of MMA including possessing solid wrestling, powerful striking and impressive conditioning. The step up in competition will be very indicative of the career trajectory going forward for Cruz as he currently is one of the premier talents of New Mexico who is still fighting on the regional circuit. Opponent Jesse Brock has fought the likes of Donald Cerrone (155-pounds), Demetrious Johnson (!25-pound UFC Champion), Travis Marx and Tyson Nam. If Cruz picks up a win over Brock, he will definitely stand out as a fighter who is ready to emerge into the next progression of his career. Brock has finished most of his fights with submission so the top-heavy offense of Cruz will certainly be tested. Stay tuned fight fans for more event coverage, bout breakdowns and analysis. Bellator 105 is only two short weeks away and the October 25th event date will approach us before we know it. Make sure to get with one of the Bellator fighters to get your tickets and if you aren’t able to make it to the show, the local undercard will be broadcasted on Spike TV’s online site.